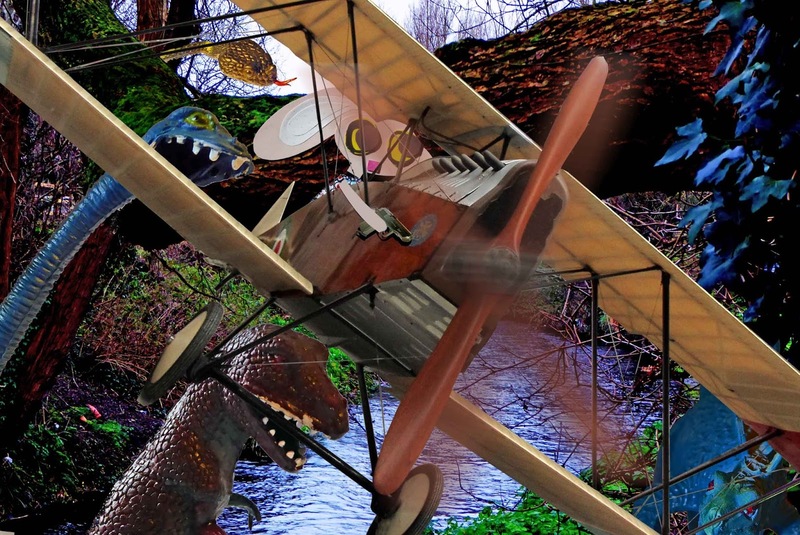 Leaving the Lepus far behind, Lapinette and Susan the Biplane scouted the Forgotten Zone. They flew low. The narrow channel was indeed lined with dinosaurs as anticipated, but it was the only way across the Zone and nothing could be done. From the ground, Lapinette heard a roaring chorus of disapproval. "What's all that noise?" "It's supposed to be quiet." "I seldom heard such a din." "I'm never coming here again." A dinosaur grabbed Susan's under carriage and tried to chew. Susan shook hard. "There's another one," said Lapinette. She hung out the cockpit and levelled her automatic. "Don't shoot," cried a creature. "I'm a vegetarian." Susan wrestled her undercarriage from the dinosaur's teeth and followed the channel as it wound through dense foliage. All that could be seen were cantankerous creatures, who complained bitterly about anything and everything. With a sudden rustling, the sharp toothed head of a plesiosaur emerged from the trees and snapped close to Lapinette's head. "You've no forgotten puir wee Nessie have ye?" Lapinette was taken aback and so was Susan. "Nessie, what are you doing here?" "I'm having a wee bit holiday," said Nessie, "but the weather's been as dull as a dishwasher." Lapinette had no time for corrections. "Nessie, the Wabbit needs to get the Lepus across the Zone." "What's keepin' him?" asked Nessie. "Heavy weather," shrugged Lapinette.